(or for the adventurous) in a sun room, conservatory, or out in the garden! It is important to pick a space where you can actually get work done, whilst also in fairly easy reach of amenities such as the bathroom. If the house is deserted during the day this might be easy. Not so easy is if you have kids or other householders coming home in the afternoon who might interrupt you. Many people like being able to look out a window, or at least out at a distance, to give eyes a rest from the computer screen. Having a wall right in front of you can be challenging. Also consider whether you are going to need power and telephone, which might limit your choices. It usually isn’t that big a deal to get another power or telephone point installed but it might not be something you want to deal with on day #1 of your new home office. Very important! Clear the space. Everything that isn’t bolted down, move it out. This gives you an opportunity to clean as well as assess how much space you have to work with. If you need shelving, now is the best time to install it. Trying to drill holes in the wall for shelving can be annoying once your desk is in place. See tip #3 below for some specific advice. If you want to paint or wallpaper your space, this is your last chance! Once the space is ready you can add the larger furniture back in: desk, storage, and chair. If the space is small, perhaps in a corner, you might also want to read How To Make A Home Office In A Small Corner which offers more tips on tight fitting spaces. Every office, home or commercial, tends to accumulate a lot of ‘stuff’. If you have a dedicated work area then shelving is probably the best storage option to start with because it keeps everything visible, and you can always use bins, baskets and buckets on the shelf to accumulate small items. However if your space is shared with other members of the house, or guests, you might want to consider cupboards and drawers to stash away your gear. Everything can be hidden away, but of course at a cost: many people tend to keep stuffing gear in those cupboards and drawers and it won’t take long until you find yourself spending a lot of time digging through them to find what you want! Natural light from the window falls on the workspace in front of you, rather than hitting your back if your desk was towards the camera. There is supplementary lighting – in the form of a sleek long desk lamp on the left, and strip lighting on the right. The light switch is also right in front of you so no need to get up if you need more or less light. That supplementary lighting is key, especially if modifying the windows or ceiling lights is not possible. Table lamps can be had for little money, can follow you if you move house, or be reused in another room if you want to change your decor later on. Phone and good quality headset, such as a Plantronics wireless headset. And most importantly make this space your own! Let the family know that when you are in this space you are working and would prefer not to be disturbed. Sure, it might take a few reminders for people to take notice, but you have to start somewhere. 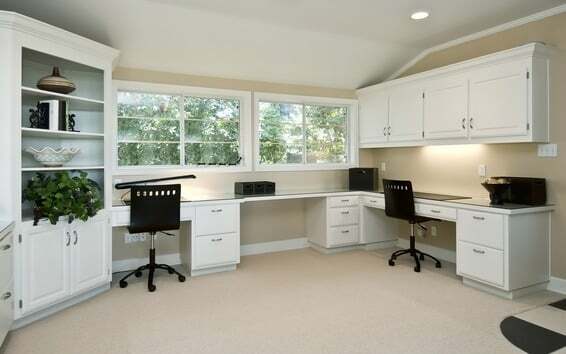 Have you recently set up a home office? Please share a picture or comments using the form below.